One of our old friends sent us a link to the PBS video Earth: The Operators Manual / Powering the Planet – and what an interesting and well-done documentary it is. You can disagree with some of the program or with some of the technologies that are presented as solutions (as I disagree about large scale wind farms) – but you cannot disagree with the theme that we cannot continue on the way we have been. We cannot continue what we are doing. We must find better ways. Where I disagree with some of the experts is in the area of self generation vs large scale energy generation. The current societal model is to have large central generating facilities – whatever the technology – and accept that over 50% of power generated will be lost during transmission. I say that smaller individual and local community power generation is not only viable, but cheaper and less prone to interruption. This 1 hour program is well worth your time. 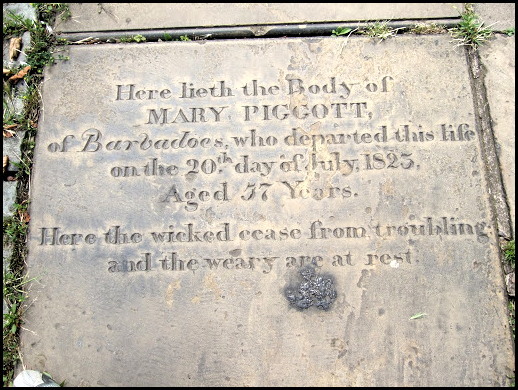 I am searching for any information which may be of assistance in helping locate the birthplace and ancestry of a lady named Mary Piggott, whose tombstone is in the churchyard of St George, Everton, Liverpool,UK, which states she was of Barbados, but unfortunately no information as to whether she was a resident or visitor to the UK, her place of residence before death, or familial status exists. To the present I have been unable to find any record of Mary Piggot, other than the record dating her interment at the above graveyard. However, I was intrigued to find that there was there was a slave owner called Mary Piggott in Barbados, and that there is a Mary E.Piggott primary school in Barbados, and that on neighbouring islands there also exist Mary E.Piggott streets. I was wondering if there may, however tenuous, be a link between the similarly named persons. Any information on the ancestral background of Mary E. Piggott may assist in my future search with my Liverpool Mary Piggott. Thank you for taking the time to read my request, a little short of detail I know. I’m hoping you or maybe some interested party may find my plea worthy of consideration.